Rung in memory of Benjamin Chatteris who was killed in action on 26th October 1916. This was Lizzie Cotton's Grandmother's first husband. Last updated Sunday, 23 October 2016 at 17:48:12. First submitted Sunday, 23 October 2016 at 16:39:56 by Anthony P Cotton. 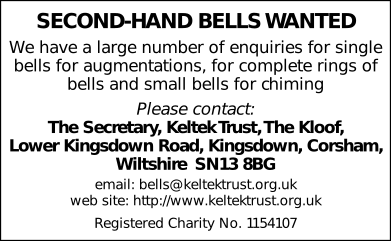 Sent for publication in The Ringing World on Wednesday, 16 November 2016 at 08:16:59, and printed in issue 5510, page 1219.